Tinned fish is a very versatile ingredient. This dish of grilled eggplant with tinned sardines, pomegranate seeds, pistachios and hazelnuts is a great example of that! The sardines in this recipe have been sustainably caught by Fish Tales fishermen amongst the coast of Cornwall. Check out the recipe and behind the scenes video on sardine fishing right here! 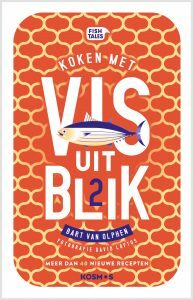 This recipe orginates from the book ‘Vis uit blik – deel 2’ (publisher: Kosmos Uitgevers) – now only available in Dutch. Cut the aubergines lengthwise into long slices. Place the slices on a baking tray covered with parchment paper, drizzle some olive oil over and put salt and pepper on top. Grill the vegetables 15 minutes until tender and golden brown in the oven. Heat the sardines on a separate baking tray for about 3 minutes. In the meantime, heat a frying pan over medium heat and roast the pistachios and hazelnuts in a dry pan until they get slightly brown. Set aside. Divide the aubergine slices over two plates. Put the sardines on the aubergine, top off with the pistachios and hazelnuts, mint leaves, pomegranate seeds, salt and pepper, and drizzle with lemon juice and olive oil. Serve immediately.